Are you wanting to pass your Basic Appraisal Procedures Exam? If so, you’re in the right place. If you aren’t then you may way not want to waste the next 5 minutes of your life! Before we get started, let me plug my study resource, Appraisal Procedure Test Questions . It’s under $20 bucks and comes with our 100% pass guarantee. Small price to pay for all the surveying we do to collect data for this exam. Inside our exclusive member area, you’ll find a ton of the actual exam questions such as these. Here is an example of one of the harder questions you will see. This is a sample question for the basic appraisal procedures test. However, most of the appraisal test questions are much easier, like this one. So far in 2018, we’ve surveyed over 100 students who have taken this exam. Out of those who did not use a third party study guide, 60% passed the test. I’ve got a ton of sample questions here that come from people who have already taken the test. We have questions that are almost exactly what you will see on the exam. Pass our test, pass the exam. It’s that simple. Ok guys, so back to the freebies info regarding Appraisal Procedures. It doesn’t matter what sort of appraiser you want to be. Commerical real estate appraiser? Gotta have it. Residential real estate appraiser? Gotta have it. It’s a necessity for getting your trainee license. Basic Appraisal Procedures is different than Basic Appraisal Principles. Hopefully you paid attention in class to know what these differences are, but if not, let me throw you a list of what is going to be on the exam. Now open up, I’m about to pour a lot of free information down your throat. • There are six procedures for analyzing land or site value. Know what they are and how to use them. • There are eight steps in the valuation process. Know them. • Analyze sales so you’re picking out the best comparable properties. • Be able to list the types of reports used to communicate the appraisal results. I can hear you moaning already. “But I want to see more questions that will be on the test!”. Fine, you lazy millennial. Here are a few questions that are on our website, our Appraisal Exam Questions that are the exact same or similar to what you will see on the test. Exam Question #1 Who determines who the intended users will be? Exam Question #2 What are the four criteria to determine a property’s highest and best use? Answer – Legally Permissible, Physically Possible, Financially Feasible and Maximally Productive. 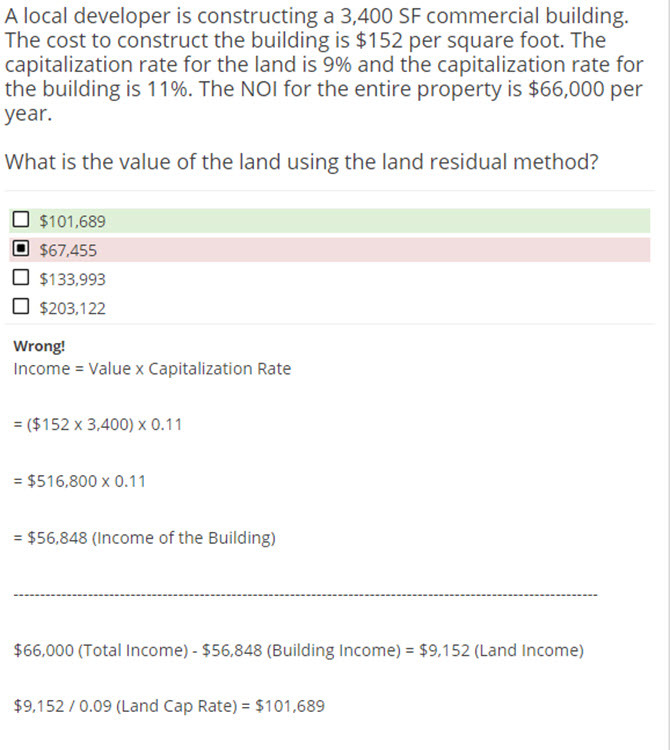 Exam Question #3 What are the three approaches used in valuing improved properties? Free Exam Appraisal Test Question #4 :The conversion of income into value is called what? Whoa! You just received six appraisal test exam questions for free. Consider getting the rest of the goods here to keep supporting our work. Good luck on your test my e-friends! I’m sure you will crush it. Do you offer online study guides?